A1 Mercia Taxis is a taxi and Private Hire Vehicle (PHV) company based in Hinckley, Leicestershire. A1 Mercia Taxis are also experienced in providing taxi services to, from and within surrounding towns, districts and villages, which includes Hinckley, Burbage, Earls Shilton and many more. 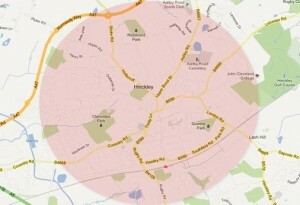 The Outside area of Hinckley shown on the local map above, We provide Private Hire Vehicles for journeys to many UK airports including Biringham Airport, East Midlands Airport and London Luton Airport. We also deliver passengers to railway stations including Syston Railway Station, Leicester Railway Station and South Wigston Railway Station. A1 Mercia Taxis are also the best choice for your journeys to and from significant local places of special interest, including Desford Bird Garden, Twycross Zoo, and Bosworth Battlefield Heritage Centre etc. Please use our Fare Guide Calculator as a guide to our Fare Prices or you can contact our office on (01455)-636363.